It takes a moment of reflection to grasp the age of these rocks. They date from the Precambrian Eon, somewhere between 500 million and a billion years ago. for work rendered so patiently. This bluish-gray, Keweenawan altered basalt is the hardest basalt-type rock in America—so hard that boulders of it were used by NASA to test the drills employed on the moon probe. 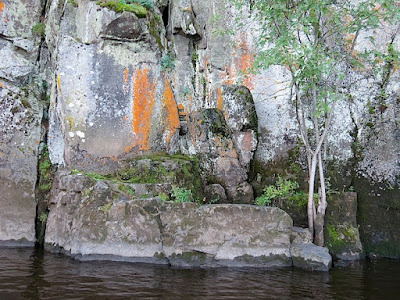 Since this type of basalt is found almost entirely on ocean floors, these terrestrial outcroppings in the Upper and Lower Dalles of the St. Croix River (which forms 169 miles of the border between Minnesota and Wisconsin), are considered quite rare, if not unique. The brushwork—ranging from broad splashes, to wispy dry-brush, to seemingly random spots and drips—looks wild and free for work rendered so patiently. 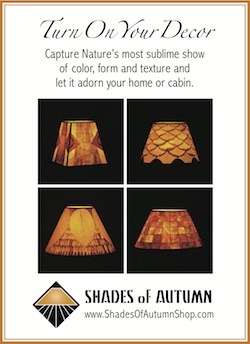 For that trick of time, for the composition of form and color and texture, the technique is breathtaking. * There are more than 10,000 species of lichen. They are composite, symbiotic organisms often comprising both a fungus and an alga. The former provides structure; the latter, sustenance, through photosynthesis. Most species grow less than a millimeter per year, and, given a durable substrate like this primordial basalt, can easily live for centuries. Wow! I'm in awe too. You know, I think I saw something similar on my drive up to Thunder Bay years ago-- outside the Duluth area. Is that possible? Jennifer -- Yes, I think the bedrock up there may be similar, if not the same.